Open up the roof and side to reveal a very well equipped kitchen area with sink, stove, drawers, cupboards and even a fold-out ironing board. There’s a seating area which converts into a double bed and coffee table. There are 2 further fold-out bunks on board and towards the rear there’s a shower room with fold-out loo and a wash-hand basin. 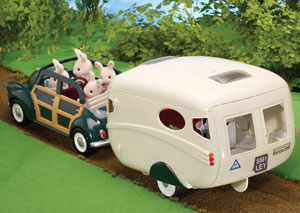 The Caravan is designed to be towed by the Family Car which is included in this set in Green.